I have no idea what the game is even about. But it's just saving stuff as you go along? 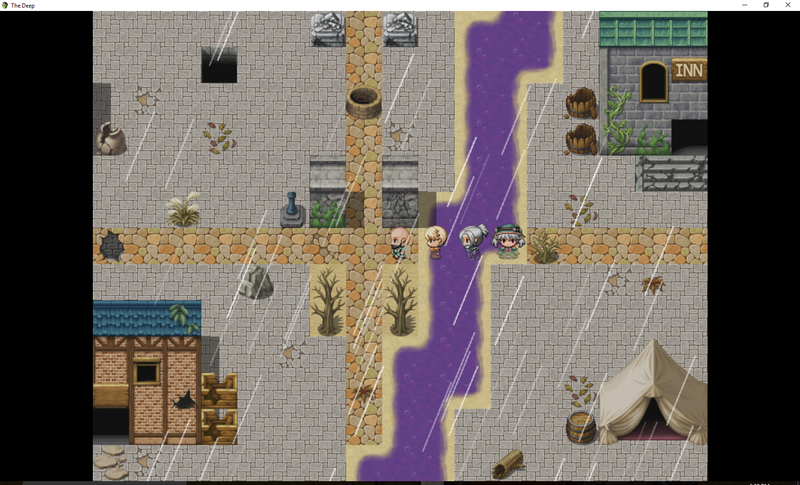 The game is so simple and standard turn based RPG Maker that there’s nothing much to talk about. There’s no real sense of exploration on the maps and so on. It’s just plain and forgettable. The game starts in a DnD fashion which I think could’ve been delivered better. Which means terrible pacing. Randomly generated map hurts. And most of it is sample maps. Nothing about this game is appealing enough for me and for a contest with a huge prize money, this is a big deal. The story starts with some weird pacing and I had no idea what was suddenly going on with the protagonist Allan or how he knew this girl. There’s just no pacing and it wasn’t very engaging. Ultimately, I commend the dev for trying. Hey Mister Allan Bays! Alright! I've played the game and here's my take. It's a straight up adventure RPG and due to time constraints it need to be dialed down a notch, I understand that part. I liked it or what I've played of it so far. I got stuck after I met The Business Guy 'Rand'. I didn't know what to do. Here's the breakdown. - Good story, I encourage you expand the story to full game. - Good characters, maybe a little more development on them but I liked them as it is because personalities did come up upon just meeting them. - Battles seem to be balanced enough to make the game shorter. - Maybe a reminder of what the player is currently pursuing because it can be forgotten really quickly. Like a quest log for example. Hey Allan! Your game was quite nice, it wasn't too complicated and went right into the action and that's what i liked most about it. Thank you! I'm happy you enjoyed it, thank you for taking the time to play it! A very fun little game to keep you occupied if you've got time to kill, sure it's not super impressive visually, but the music's good, the combat is solid and after playing through it once. I've got very few negative things to say about it, though at the same time there aren't a lot of positives either, I don't dislike the game in any way, but I can't really say it's my favorite thing to come out of the IGMC, of course this game WAS (as far as I can tell) made by one person (and speaking from experience, making a game by yourself is HARD, let alone doing so within a month and have it come out this solid) so well, if you're reading this then I hope you decide to give this game a chance, you just might like it. NOTE: I had SOME problems with the game (not sure if only on my end or not) the only real problem I had gameplay wise is that when you're supposed to go to the zombie town and I guess you're supposed to meet up with Rand... I never did, he opened the crypt for me like he was supposed to, he made comments when I beat the gargoyle boss, but he never ACTUALLY joined my party at any point, I think I checked the entire town, but I never saw him, I was also disappointed when Meiji left, right after meeting him (does he join you if you DON'T have the half elf?) other than those two nit picky little things I didn't have any major complaints. 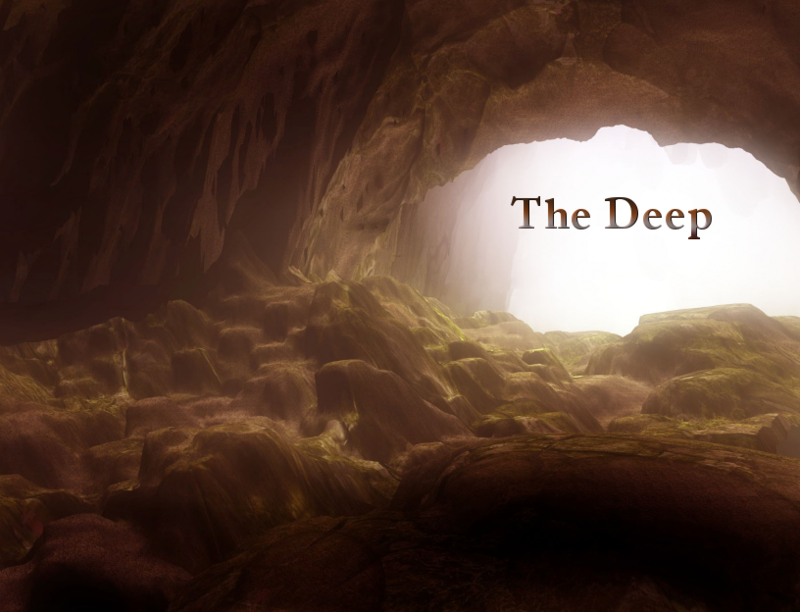 The Deep, as described on the project page, is created by an old-school Dungeon Master (ala Dungeons & Dragons). Even if this wasn't stated upfront, it would be totally obvious after playing for just a couple minutes. The game starts out just like a new D&D campaign typically does. You are some random dude with a personality based off of a single trait, gruff in this case, and you find yourself shipwrecked and stranded on an island. Fortunately, there's a small village nearby and the first person you meet is like, "Hey, I'll join up with you" and you go to a nearby cave to defeat the creature that's been terrorizing the village. The Deep is very standard, default and straight to the point. Now it may sound like I'm bashing the game but I'm not. I'm also an old-ish-school D&D player and sometime Dungeon Master as well as an old-school JRPG fan. The Deep is a first project by the developer yet it avoids making the mistakes that many do when starting out. It's not trying throw in a crap-ton of extra systems and plug-ins. 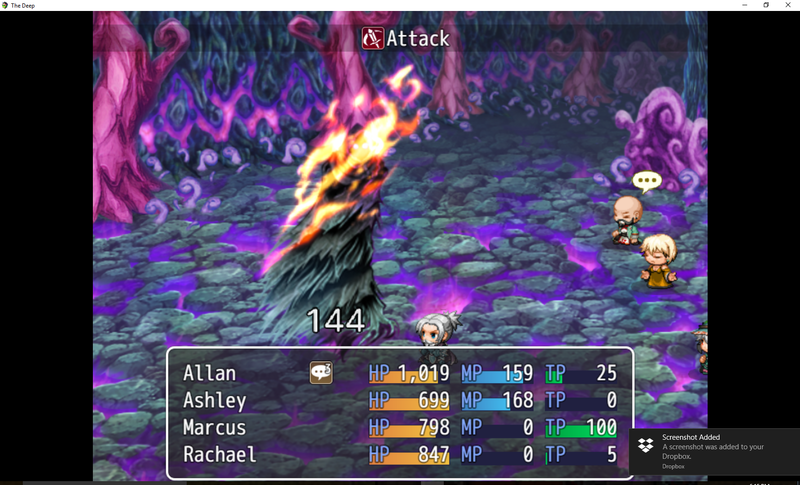 It's using RPG Maker out of the box and utilizing it for what it does best. Oddly, that actually makes this game stand out to some degree because almost no one seems to make the type of game that you can make with the default engine anymore. I too am guilty of this. So yeah, you're not going to be awestruck by the graphics or mapping. The game play isn't groundbreaking. The story and character development is pretty sparse. But it's fun and playable and doesn't have any overly glaring flaws. This game is much better than you'll find from most first projects. 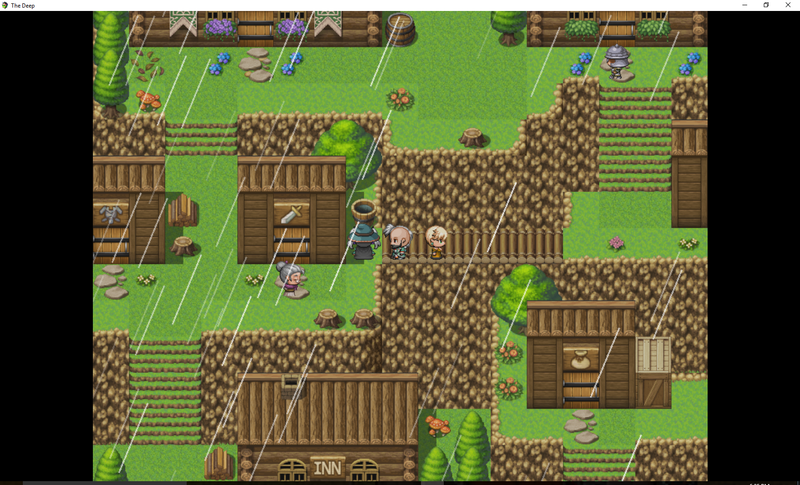 I'm definitely going to keep tabs on this dev because when he has time to learn the RPG Maker engine more thoroughly, I have a feeling that some really cool games will come. Thank you so much for your review! I'm happy you enjoyed it for what it is that is exactly what I was shooting for. I've already got several new ideas for games to come after the Deep is complete (with better assets too!) Thank you for the encouragement! No problem. You're off to a great start. This is exactly what I should have done for my first project. Instead, I'll probably never finish it. And you did it in a month even with the learning curve added in. Interesting music! Also, interesting premise with the rise of human civilisation from an underground network of tunnels! There is definitely more to be expected from this! Perhaps the network could be littered with more artifacts from this past human civilisation that form a story about it? I feel they are much too important to be left so bare, aside from the intermittently hidden potions and stuff. I found and defeated the Death Knight in the Flora ruins, but could get nothing from the guild. Surely you are planning to put a suitable reward there? I also one-shotted the Felhound for some reason. Quite many tiles in Flora appear extremely questionable. Is there a purpose for that? Toward the North I thought that there was maybe a bridge to cross the miasma, but the object in question turned out not to be. Characters get about even utility among themselves, which is good. A comment below did already mention the haphazard introductions between characters, which is still particularly noticeable when it comes to the very first two characters, Allan and Ashley. Was Marcus pictured in the screenshot available in this demo? If so, then I missed him entirely. Thank you so much for your feedback! Especially about the Deep and signs of humans civilization that is a wonderful idea for more immersion! I am sorry about the death knight quest I'll make sure that gets fixed up before the full release. As for Marcus I took him out already just before the submission for IGMC 2017, he is not particularly relevant to the story yet at that point he was just there originally to showcase his abilities. Also in the original Demo Meiji joined the party for the duration. I did these in response to the same comment you referenced below, just to show you how seriously I take all of this feedback. A fun little game using the RTP primarily :) I think I spent more time poisoned than not, though! 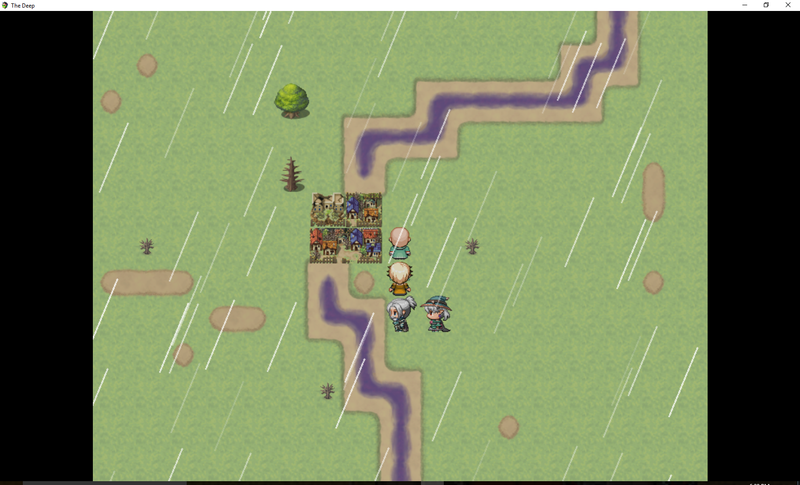 I found the difficulty of battles to spike once out of the Deep and was running into squads of 6x campys which all went first and would just utterly destroy everyone (they had the newest/best gear from town, too). The premise is pretty simple and straightforward which goes well with the game overall, as it is all fairly simple and straightforward which is not a bad thing at all. Sometimes you just want to go into a dungeon and kick a few bad guys, ya know? And this game scratches that itch. I did wish the visibility radius was larger in the dungeon though! On a side note, the main character I found to be kind of hilarious because 1.) he looks like my brother, and 2.) he seems kind of crazy in the "come get some!" sort of way. This is about the tenth of the contest entries I've tried out and it's the first one that really been able to hold my interest at all. 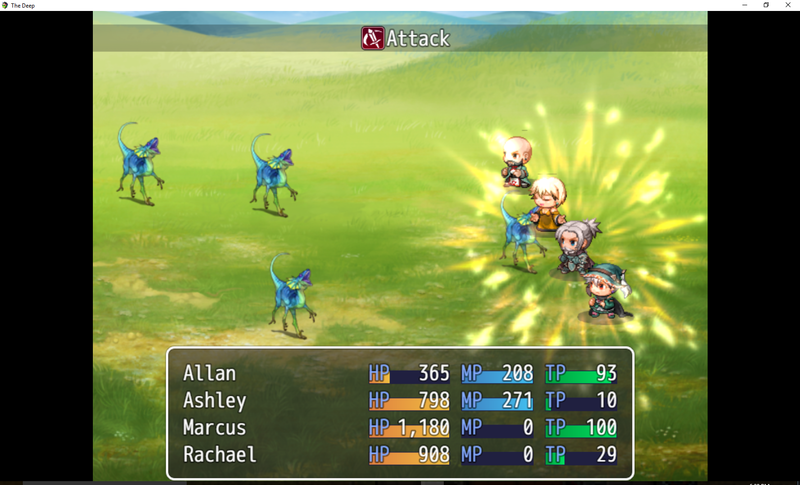 The basic rpg formula has been around forever for a reason. My only complaint as an old DM myself is that it's a little bit too easy. But that might just be because I'm kind of a hardass. Great job. I'm happy to see more people learning to make games. 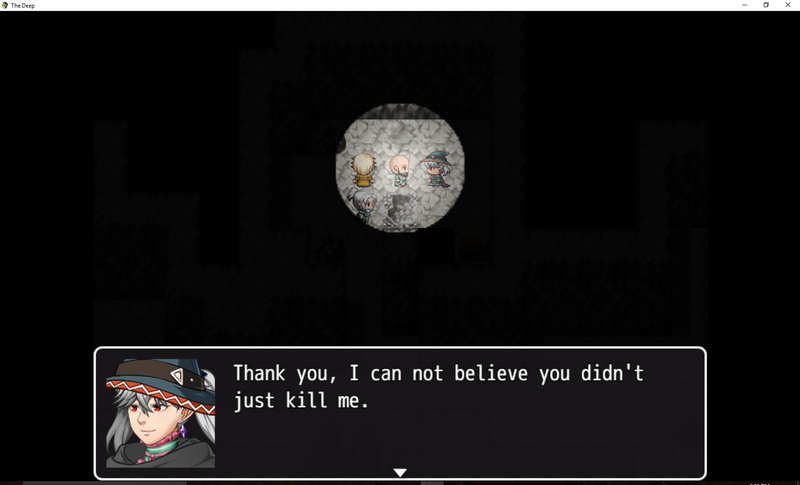 Rpg Maker is such great software. Keep it up. Thank you! I am looking forward to many more years of RPG making! I would say, it's a okay game with pretty generic elements and nothing exciting happening. Reminder of the simpler times, still it's a good first game. Simple is good! Congratulations on completing your submission. You exported your project with a save file and the folder not named after your project - I didn't actually know which submission I was playing until I opened the actual game. The line of sight in the deeps is way too small - I had to stop playing after level 3 as it became less immersive and more irritating. Thank you for playing and I renamed the file that was a good catch thank you. As for the light radius in the deep I think you are absolutely right, it's hard for me to tell as the developer since I know where to go, thank you so much for the feedback it is so important to me! It's good, but how we get character, it's a little bit random. They just... appear and join. Randomly. Thank you again, I have completely redone the first hour of gameplay to be more in line with what I want in the final version and less to do with showcasing all of the characters. This is the last edit I am going to do for the demo.